“Abundant Life,” was launched as a dream, before she came off the drawing board. 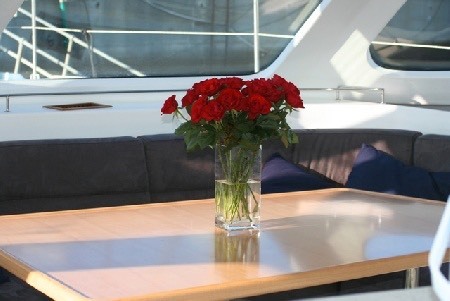 Owner David Leppan, having experienced bare boat charters, planned for a life aboard. Space, comfort, safety, and speed were the key design criteria. With sailing/cruising experience already under the belt, it was time to plan, and then turn into reality, the real thing. Designer, Anthony Key, produced the working drawings and the project was initiated. 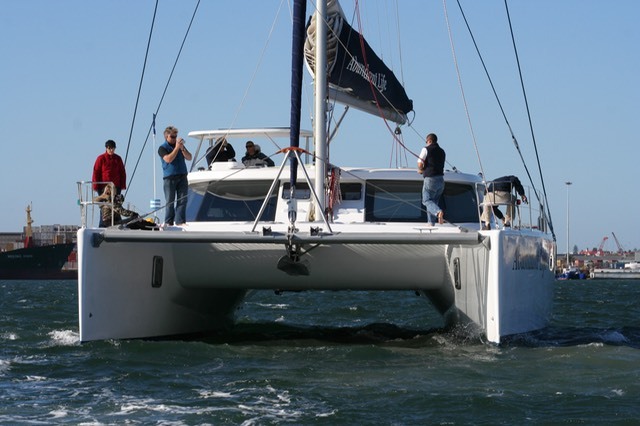 A 55 ft sailing catamaran, manufactured using foam coring and epoxy resins throughout,was the project brief. 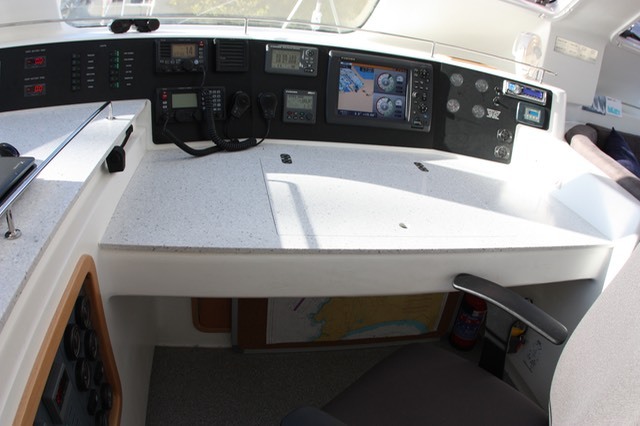 Spacious sponsons, a wide beam,high bridge-deck clearance, and a raised helm station, called for a different approach to the placement of deck hardware and engine room layout. 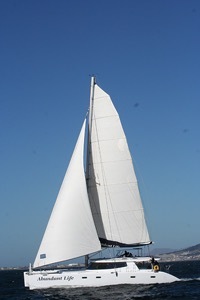 The design performance under power required the use of twin 110 hp, 4 cylinder Yanmar diesel engines. The engines provided power to the folding propellers via direct drive gear boxes. This allowed a simple and compact installation which is in turn maintenance friendly, an absolute necessity for a vessel that undertakes extended passages at sea. Scheduled engine maintenance in a calm sea, is challenging in confined workspaces, and becomes prohibitive in rough seas unless due care is taken to give proper access to key equipment.The fuel system incorporates the use of day tanks and a fuel scrubbing system.The built in storage tanks have access hatches to facilitate proper cleaning when required. 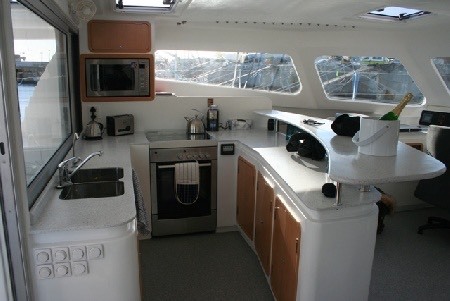 This vessel is luxuriously appointed, and therefore demands a high electrical power availability for both 220 and 12 volt systems.A full Mastervolt power system is installed which includes Mastervolt battery cells, charger/inverter,and all electronic monitoring equipment. 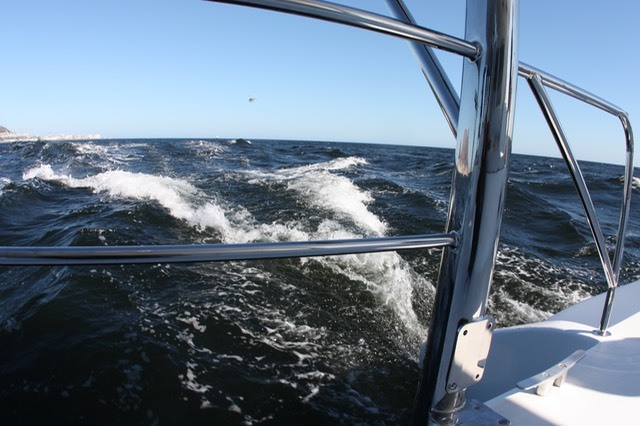 The 7 kw gen set provides power and charging capabilities when the vessel is at anchor. 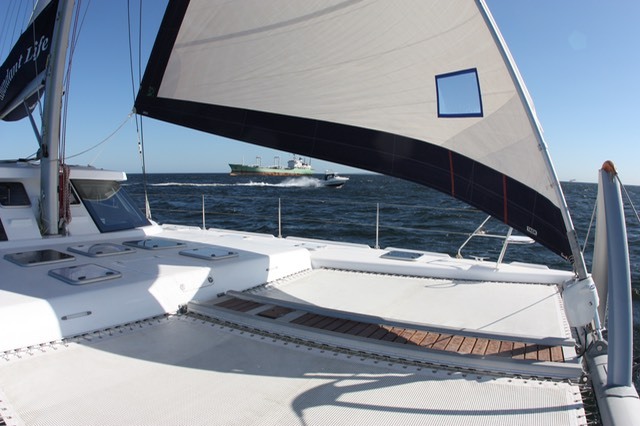 During sea trials held in Table Bay, Abundant Life recorded the design speeds ,both under sail and power. 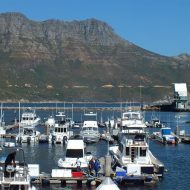 On her first shake down cruise to East London, her home port, she was to consistently sail at 22 knots, whilst exhibiting comfort and stability to the crew. “Abundant Life” is cruising the Indian Ocean and doing what she was built for. 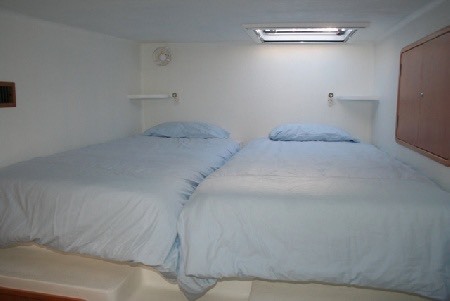 4 x En Suite Double cabins. 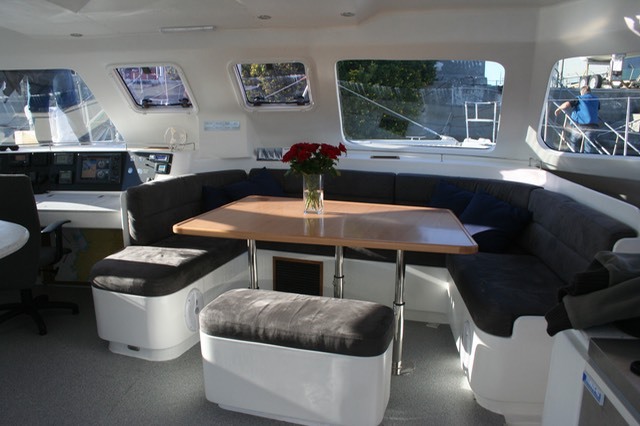 Saloon incorporating Galley, U shaped couch and Navigation Station. 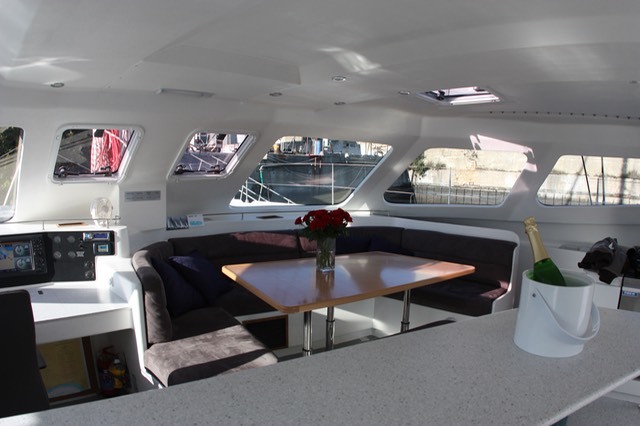 Aft deck with weather protection from extended coach roof. Raised helm station with centralized winches and lines. Engines: 2 x Yanmar 110 hp 4 cylinder diesel engines. Fuel tanks: 2 x 1000 litre aluminium with transfer pumps and fuel polishing system. Water tanks: 1000 litre total capacity in two tanks. Watermakers: 1 x 200 litre/hour engine driven. 1 x 50 litre/hour ac powered. Black water in built in tanks. Electrics: 2 x 3000 watt inverter/chargers. 1500 amp/hour house battery bank. Separate batteries for winches,windlass and sail furlers. Powered halyard and reefing winches. 2 x 130 litre fridges. 1 x 200 litre chest freezer. Gas cooker hob and oven with griller. Gas cooker and hob in cockpit. Airconditioning in sponsons and saloon. Fresh water system, interconnected and pressurized. 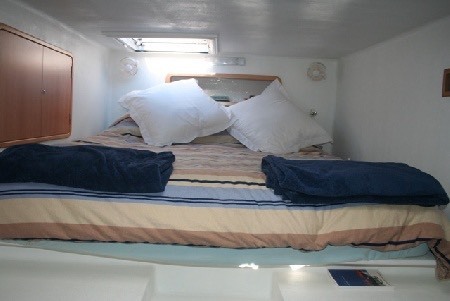 Out door showers on transom and at mast step. 2 x Main anchors, Fortress and Delta. 1 x Stern anchor, Fortress. 1 x 10 man life raft. Category A safety equipment for 10 persons. Satellite telephone and solar charger. Hand held gps and vhf . 1 x Semi rigid 4,5 m with 40 hp outboard engine. 1 x Inflatable 3,2 m with 15 hp outboard engine.